These features are available on the Manage Campaigns and Campaign Details pages. The media is taken from the Campaign Details page, but functions the same on both pages. Type in the text you want to filter by. This can be done across all columns, allowing you to search for revenue, spend, and more. Clicking on the column header will switch between sorting by ascending or descending values. Use the Eye Icon to show the options for what columns you want to display or hide. Click away on the screen to hide the column chooser menu. If you have columns hidden, a message will tell you that you have this filter enabled above the Eye Icon. You can drag to group by the values in columns by dragging the column header to the area right above where it says "Drag a column header here to group by that column". Other columns can be dragged to have more grouping options. While the headers are in the grouping area, you can also click on them to sort. To view the groups, click on the arrow to expand the report for that group. Reporting and charts show data from the filters you have selected. To learn more about Filtering, click here. All charts and reports use the currently set filters. The At A Glance Report shows the stats of the number of Campaigns, the total amount they have Spent, the total Revenue of those campaigns, the total Profit of the campaigns, the Profit Percentage (Profit / Revenue), the total number of Clicks the campaigns have, and the total number of Sales. Recently Added lists the last 10 campaigns created. Most Active lists the campaigns with the most clicks. Least Active lists the 10 campaigns with the least amount of clicks with a minimum of 1 click. Most Profit lists the 10 campaigns with the highest profit. Least Profit lists the 10 campaigns with the lowest profit. This report is a useful resource to see how campaigns are doing: which are the most active, making the least profit, and other options. Remember that these stats are dependent on the filters, which allow for more precise looks into how campaigns are performing. The Profit Breakdown Chart displays the profit for individual days based on the Date filter and Days filter you have selected. Green columns indicate days where there was Profit, and Red columns indicate where there was Loss (negative profit). 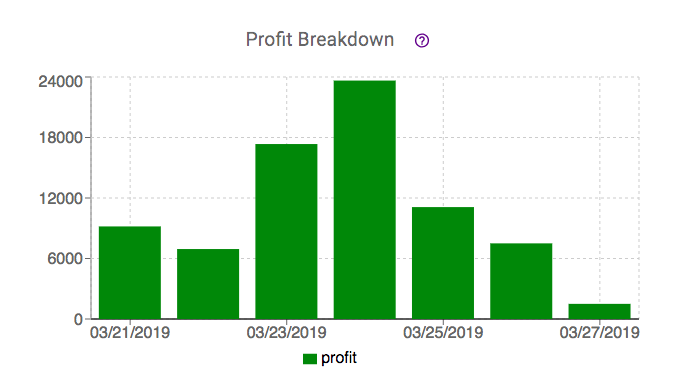 You can use the profit breakdown chart for a quick glance into what days your campaigns did well on, and what days are not near your target profit. The Campaign Performance Chart works similarly to the Profit Breakdown Chart. Performance is broken down by the filters, and dates shown will have columns for both clicks and conversions. 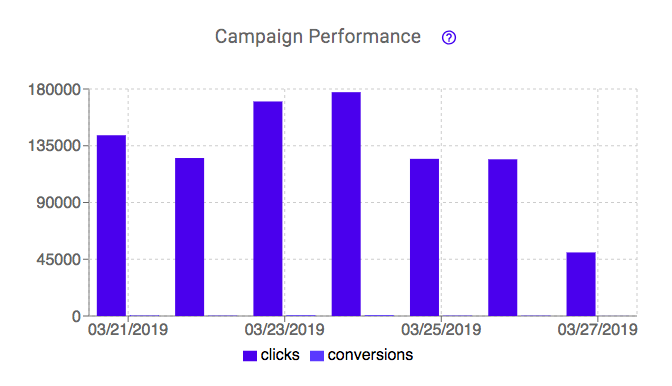 By seeing the clicks and conversions for days side by side in chart form you can see how your campaign is performing over time. Hovering over the individual days can allow you to see the CVR. Couple this with day parting and you can pause or lower CPC for campaigns on days you think are underperforming. The Image Performance Chart shows the top spending images across the filtered campaigns. Click on an image to view the campaign details page for that campaign. This chart displays the amount spent for that campaign, the EPC (Earnings Per click), and the Campaign Name it belongs to. As you compare top performing images across the campaigns filtered, you can see trends over what the images look like. Analyzing if darker images perform better, images that contain the product versus just a model, etc. These top performers help you understand what type of images are getting a good EPC compared to the total Spent cost as well. The Weekly Comparison Chart shows the comparison of data of the past 7 days (starting with the current day) to the 7 days prior. This data includes a comparison of total clicks, profit or sales. This chart can also be filtered to display the weekly comparison of based on network, user, tracking type and campaign active status. Compare profit from this past week versus the previous to see what performance looks like over the filtered campaigns. By monitoring trends you can evaluate what changes have been made or what needs to be worked on to continue optimizing your campaigns. The At a Glance Report on the Manage Campaigns page is similar to the report found on the Dashboard. This report shows the stats of the total number of Clicks the campaigns have, the total number of Sales, the total amount they have Spent, the total Revenue of those campaigns, the total Profit of the campaigns, and the Profit Percentage (Profit / Revenue). Like the Dashboard At a Glance Report, you can see the totals of all campaigns under your filter settings. On the Manage Campaigns page you can click through to those campaigns for further understanding, get an overview of the individual campaigns, and quickly pause or activate campaigns as well. Use the Download CSV button for a downloadable spreadsheet to display all of these campaigns. You can search, filter and reorganize the Campaigns Report as stated in the Reporting Features on the top of this page. The Sites Chart shows Spend and Revenue side-by-side for sites (that have received clicks) over the time frame selected in the filter. You can also view the actual Spend and Revenue by hovering over the sites. Where has this campaign been spending the most? Should I make changes to site bids by updating the site CPC? The Clicks/Conversions Chart displays the Hourly Average of EPC, CVR, Clicks, and Conversions for the time frame selected. Hovering over the chart will show you the hourly average across those days selected. Hovering over the chart will also display the Profit % hourly average. Click Download CSV to export a report of the chart. Data in the report will be the data based on the selected time frame. The Clicks/Conversions Chart is used well in conjunction with Day Parting - by viewing campaign performance on an average for different hours in the day, you can decide to limit CPC or pause the campaign entirely during low EPC or low click periods throughout the day. Using this chart also helps in making evaluations of how well the campaign is doing throughout the day to assist in making optimization decisions like removing images or how to run similar campaigns. The EPC Chart displays the EPC over the time frame selected. Using multiple dates lets you see the trend of EPC throughout those days. You can also hover over these points to see the exact EPC for that specific day. The trend of earnings per click over multiple days shows how the ads in the campaign are performing across these days. The higher the EPC the better the images are doing on that day. It may be useful to utilize Day Parting to pause campaigns on days that are getting a lower EPC than others. Remember to look over multiple periods of time to get a clear idea, sometimes campaigns don't do well one day, but the same day last week they were great. Keep in mind what ads were running during these times as well. The Hourly Clicks Chart gives a detailed look at the Clicks and Conversions for the Last 24 Hours. On the right side, there is a breakdown of the number of Clicks and Conversions that has happened in the last 5, 10, 15, 30, 60, 90, and 120 minutes. 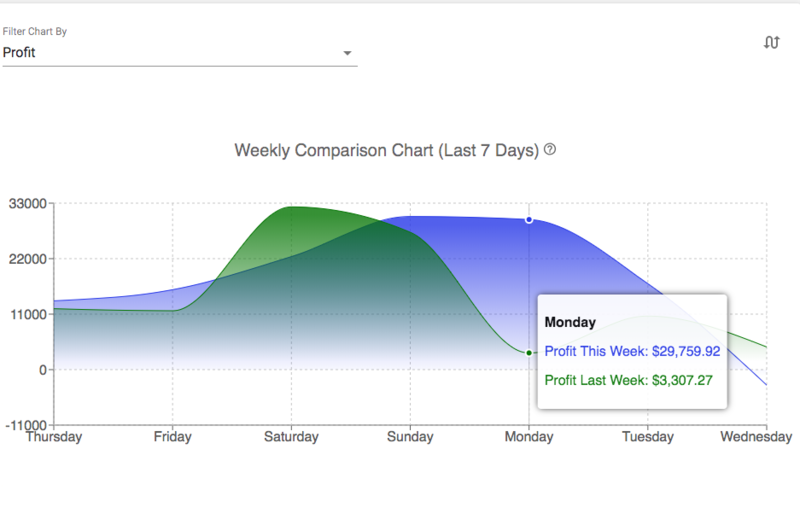 You can hover over the chart to see the exact clicks and conversions at that time. There is a separate bar on the bottom you can adjust to view specific time frames, and you can also drag this bar to view that amount of time over the past 24 hours. The Y-axis will automatically change based on the amount of clicks seen. The minute breakdown of clicks on the right of the chart is an easy way to see recent campaign performance during the last 2 hours. The detailed graph of clicks and conversions, adjustable over a time frame with the bottom bar and dragging the bar over the last 24 hours, lets you see a visual representation of clicks that can be quickly evaluated. Campaign Details Reports are available in an expandable menu by clicking the icon next to the report name.You can collapse or expand the reports menu by clicking this icon. When you select a report to view, Maximus will remember the last report you viewed and display it when you go to another campaign or refresh the current page. This Campaign Details At a Glance Report is similar to the Dashboard and Campaign Details. It also includes the current campaign CPC, the current campaign Budget, the CVR, the Campaign ID, the campaign Creation Date, and the Sub Account it is under. You can edit the CPC and Budget from this area on the campaign by clicking on the value, entering a new one, and submitting the value. The Average Conversion Time, or ACT, is also located on this row. It shows the average amount of time between a click and a conversion for that campaign. You can remove the last row by click the Show Less Details button and show it again by clicking the button again (Show More Details). The Sites Report shows all sites which have received clicks in the time frame filtered. From the Sites Report you can bid on sites by typing in a value and clicking the Update Bid button. Click on the arrow to the left of a site to view the expandable menu for that site. Remove Site Bid will set the site bid back to the campaign CPC. This is useful for both managing the CPC and also managing total site bids for Taboola and Outbrain as they have a limit to the number of total site bids per campaign. The Hourly Clicks will function exactly like the By Hour Report described below. You can also download a CSV of the stats for this report. The report will download with all columns, not just the ones you have visible. Block allows you to block sites in Outbrain. Click here to read more about Site Blocking. To learn more about Site Bidding click here to read our documentation about the subject. Site bids for Outbrain may appear temporarily at a CPC value outside the lowest and highest bid due to site bids and campaign CPC updates happening separately. The campaign CPC update will follow within one minute and site bids will correct themselves to back inside the appropriate high/low bid amounts. Some networks have limitations on the number of sites you can bid on. The Sites report is different for Gemini, please review the section below for the Gemini Sites Report. This report gives a detailed look into how the campaign is performing on specific sites. Comparing Clicks, Avg CPC, EPC, Spend, Revenue, Profit, Profit %, Sales, CVR, Impressions, CTR, and also comparing to the Campaign CPC if you have updated the site CPC will give insight into what sites need to be blocked, have a static site CPC established, and more. You can use this information to test out similar campaigns across specific sites to see what type of ads work best on what sites. Gemini has Gemini Sites which operate differently from Sites Reporting. Click here to learn more about Gemini Site Bidding. Gemini Site Bids are done in multipliers of the campaign CPC. You can expand to view more options like the Sites Report above. The Gemini Sites Report shows the Site, Device, Clicks, AVG CPC, EPC, Spent, Revenue, Profit, Profit %, Sales, CVR, Impressions, CTR, and Network CTR. This report also contains a row entitled NA. This row displays the data that could not be attributed to a site. Maximus reconciles with Gemini throughout the day for the previous day to allocate this data to the correct sites. Add or update previously added site bids to further control how your campaign is spending. Reduce bids on lower performers and increase bids on those sites that are getting good EPC and have been maintaining good conversions. RevContent has the Site/Widgets Report which operates differently from Sites Reporting. You can expand to view more options like the Sites Report above. Clicking the View Widgets button will show a report of Widgets under that Topic/Brand. The Sites section of the Site/Widgets Report shows the Topic/Brand, Clicks, AVG CPC, EPC, Spent, Revenue, Profit, Profit %, Sales, CVR, Impressions, CTR, and Network CTR. The Widgets Section of the Site/Widgets Report shows the Widget, Clicks, Average CPC, Sales, EPC, Spent, Revenue, Profit, Profit %, and a column which allows you to Block that widget. You can bid and block with this report. Click here to read more about manual Bidding and Blocking for this report. Click here to read more about Fire & Forget™ Optimization with RevContent. Add or update previously added bids to further control how your campaign is spending. Reduce bids on lower performers and increase bids on those that are getting good EPC and have been maintaining good conversions. Use this report to examine how specific widgets performed under a Topic/Brand for the time period you have selected. The Images Report shows the Active Status, a thumbnail of the Image, the Ad Text for this image, Impressions, Clicks, Avg CPC, EPC, CTR, Spend, Sales, CVR, Revenue, Profit, Proift %, and the Creative ID generated when you added the image. You can also click next to the Ad Text on the clipboard icon to see the keywords and emotional breakdown of words you have used. On the Images Report you can edit the Ad Text by clicking on it and entering your changes. Note that this will require Approval on the text and will also make tracking the text + image performance very difficult since you will have two different combinations after editing text. We recommend adding the same image again with new text. The Images Report only displays images which have received clicks. Compare image performance, turn off ads by pausing them, and prune off those which are not having success compared to your better performing images. Use images which are performing well for new campaigns, compare to ad text and try out different text if the image is not doing well, and more. The All Images Report is similar to the Images report, but the only columns visible are Active Status, Image thumbnail, Ad Text, and Creative ID. This report can be used to view all images, if they have not received traffic in the filtered time period you can see them here. Use this report to turn images off or on if they do not have activity for the time period you are looking at. This tab is only visible for RevContent campaigns in the Campaign Details page. The Widget Report shows the Widget, Clicks, Average CPC, EPC, Spent, Revenue, Profit, Profit %, Sales, and Blocked Status. You can block widgets in the same way you can block sites for RevContent. You can bid and block with this report. Click here to read more about Bidding and Blocking Widgets. Widgets are placements on websites that are given a Widget ID number. You can use the Widget Report to see performance of widgets, and block those that appear to be underperforming, giving your campaign a better chance to grow while avoiding spending on the poor performers. The Conversions Report will display the Click Date (when the user first clicked) and the Conversion Date (when the conversion happened) along with the Site the user converted on, the User Agent (device/platform), the CPC for that click, the Payout for the conversion, and the IP of the user who converted, and the Maximus generated Click ID. Search or group by Site to see what the stats on conversions were, evaluate the click to conversion length of time, and search or group to compare what CPCs were for these users who clicked. Search or group the user agent to find what platform/device is working well for the site. ​The Clicks Report displays the last 25 clicks for the campaign, including Timestamp (date and time of clicks), the CPC for those clicks, what Site the click was on, the User Agent (device/platform) the clicks happened on, and the IP of the clicker. Compare the recent clicks and see where bids are happening over the past 25 clicks. Drag to group the CPC, Site, and User Agent to view what the comparison on different CPCs, sites, and devices were for those clicks. The By Hour Report displays the Clicks, Average CPC, EPC, Revenue, Spend, Profit, Profit %, CVR, and Sales (total conversions). When first using the report, the individual days show up as buttons. Click on a date to view the By Hour breakdown for that day, which will create a new frame on the page with the data for the date you selected. This reporting shows the same columns, and also allows you to go to a more precise look at the stats by either clicking the hour button or using the dropdown in the top right to change between Hours and Minutes. If you click on the hour and want to get back to the hourly view instead of minutes, use the dropdown and select Hours again. The breakdown on days, hours, and minutes gives a closer look on campaign performance. Use this information with Day Parting to optimize your campaign to not run at certain times. You can investigate an increase in conversions for a time frame and see what activity happened in that hour as well. ​The By Landing Report shows all weighted links that have received clicks in the filtered time frame. The Landing Pages that have received clicks, the Clicks received, EPC, Spend, Revenue, Profit, Profit %, Sales, and CVR for that link are also displayed in this report. If you have multiple weighted links, these will display here. Compare how different weighted links perform against eachother and use this to adjust the weights of the links. If you see a great profit % on one LP but it has a lower weighted link %, consider changing it to a higher percentage and see how it will do in comparison to others. Use the Conversion Rate % (CVR) to see how well clicks are translating to conversions and decide which LPs are performing best. From the expanded Landing Site where you view the Landing Pages, you route sites to make a site always go to one specific weighted link. Click here to learn more about site routing. Compare what sites are having success with which links and determine if you may need to make adjustments to weighted link percentages. The Image/Site/Landing Report allows you to view image performance similar to the Images Report, view how each image performs per site, see performance by landing page of that image/site combination, and choose which landing page you'd like that image/site combination to route to. Click here to learn more about the Image/Site/Landing report in greater detail. The By Platform Report displays the Device (Mobile, Desktop, or Tablet), Platform (Operating System), Clicks, EPC, Spend, Revenue, Profit, Profit %, and Sales for the device+platform combination. Search or drag to group to find out which devices and platforms are performing well. You can learn about your audience and the types of devices that converters are using and use that to create new campaigns targeting that device. If your network supports it, you can also target platforms (operating systems) on their network page for the campaign. Click here to learn more about network targeting. The Gemini Bid Modifier Report is only available for Gemini Campaigns. 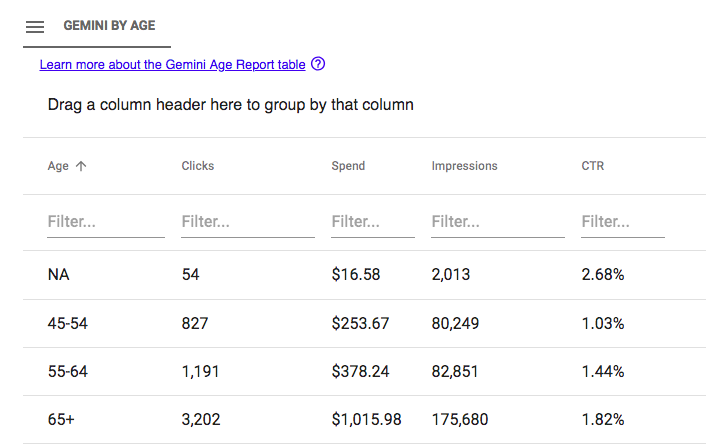 This report displays the Gemini Groups which have Impressions, and the Clicks, Average CPC, CTR, and Spend for those groups. “A” groups target desktop, while “B” groups target tablet and mobile traffic. Because Gemini does not allow platform-specific targeting, a bid must be set for each group. However, decreasing the bid adjustment to the minimum lowers the likelihood of your ad appearing on other platforms. It is recommended that you begin to optimize these modifiers once you have a measure of campaign performance. Bid adjustments are percentage values that edit your spend for specific publisher groups. Use both positive and negative modifiers to make bid adjustments. For example, if you set a CPC of $1.00 and set Group 1-A’s bid adjustment to 100%, your Group 1-A bid will be $2.00. If you set Group 2-A to -50%, your Group 2-A bid will be $0.50. To learn more about Gemini Groups read Yahoo's official documentation by clicking here. The stats for Group performance will allow you to modify bid adjustments to balance out and optimize your campaign. Use the Gemini Settings to adjust group bid percentages to make the most out of your campaign's spending. Typically Groups 1A and 1B perform the best but you may see even greater CTR on other groups as well depending on the campaign. The Gemini Age Report is only available for Gemini Campaigns. This report displays the Clicks, Spend, Impressions, and CTR for the targeted age groups. NA indicates there is no age information for those users. Using the Gemini By Age Report helps understand what age ranges are having a better CTR for your campaign. Use this information to adjust the age ranges you are targeting in Gemini Settings to optimize your campaign. The Gemini Gender Report is only available for Gemini Campaigns. This report displays the Clicks, Spend, Impressions, and CTR for the targeted gender(s). 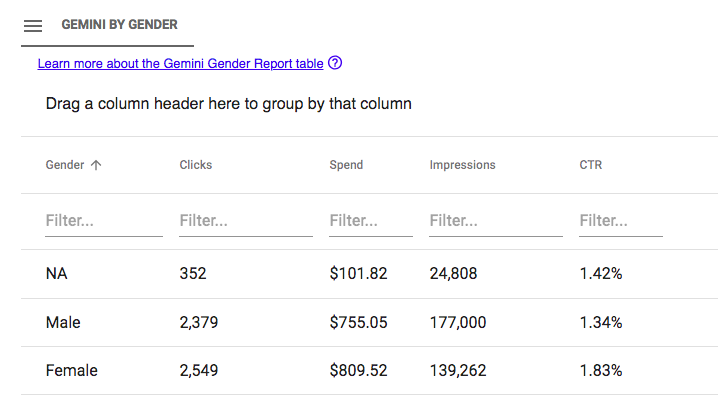 Using the Gemini By Gender Report helps understand what gender are having a better CTR for your campaign. Use this information to adjust the genders you are targeting in Gemini Settings to optimize your campaign. The Gemini Location Report is only available for Gemini Campaigns. This report displays the Clicks, Spend, Impressions, and CTR by Geo location for the targeting country. Using the Gemini By Location Report helps understand what locations are having a better CTR for your campaign. You can use this information to make targeting changes on the Gemini platform. For more information about targeting in Gemini click here. The Campaign Log Report shows the log of changes made to the campaign. Any user/sub user who has access to the campaign and makes a change will be recorded here. This log also keeps track of changes Maximus has done through Fire & Forget™, site bid adjustments, and other processes. Drag to group or search for "Maximus" to find the automated changes happening to your campaign. The Campaign Log can help determine when and why changes were made to CPC, new updates Budgets, Site Bid Modifiers, and gives a look into how Maximus operates. You can also use the campaign log to view changes made by searching or grouping the User Action column. See what Site Bid Optimizations were made, if someone did a reassignment, and more.